Quick Jump Rope Workout | Valet. 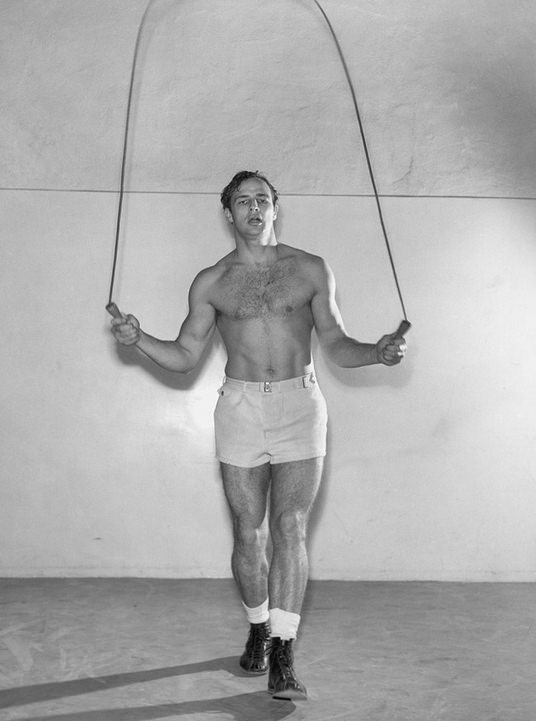 Train like Marlon Brando back in the day. There's a reason why so many trainers swear by one of the oldest pieces of fitness equipment around—the jump rope. It's not out of nostalgia. It's because that simple rope delivers an outstanding cardio workout that you can do anywhere. A few well-spent minutes with the ropes not only gets your heart rate up and metabolism firing, but you also boost your coordination and tone your legs. Things that come in handy as we prepare for warmer weather. So grab a jump rope and start doing this easy and efficient workout, and remember us when someone compliments your calves at the beach this summer. Jump on both legs (as usual) for 10 rotations. Then jump only on your left leg for 10 rotations, and then on your right leg for 10 rotations. Keep jumping and repeat the process, but only perform 9 rotations each time. Continue decreasing the number of rotations by 1 rep each round until you work your way down to 1 rotation. Keep your elbows close to your ribs. Engage your abs. Keep them tight and your shoulders down. Keep your knees soft and loose (but not overly bent). Jump on the balls of your feet. Get into fighting shape this spring by breaking out the old boxing gym mainstay: a weighted leather jump rope. How to get in shape like Kingdom's Frank Grillo.